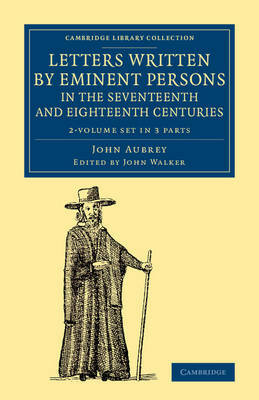 This three-volume compilation by the Oxford antiquary John Walker (1770-1831) consists mainly of manuscripts from the Bodleian Library and the Ashmolean Museum, but is significant because it contains the biographical notes on the 'lives of eminent men' furnished by John Aubrey (1626-97) to Anthony ... Wood, who was at the time compiling his Athenae Oxonienses. Aubrey's subsequently famous Brief Lives were published for the first time in this 1813 work, and, although described as the fourth appendix to it, in fact comprise slightly less than half of the second volume and the entirety of the third. Volume 1 and the first part of Volume 2 consist of letters between antiquaries including Kenelm Digby, John Cotton and William Dugdale, on topics ranging from the Cornish language to the cure for a bite from a mad dog. The remainder of the work contains 131 of Aubrey's 'lives'.